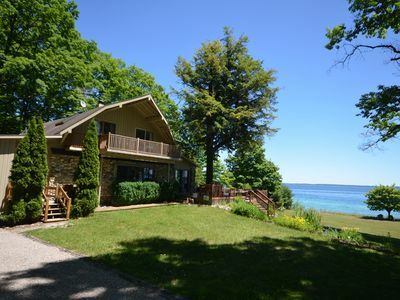 Our year-round home is located on the beautiful Christmas Cove Beach on Lake Michigan. 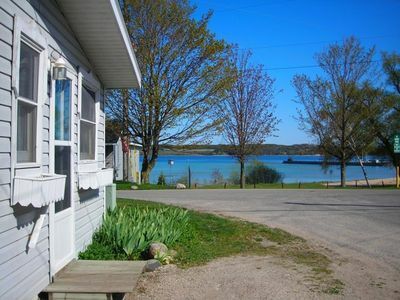 Although this is our full-time residence and not a rental cottage, we enjoy renting our paradise a couple weeks each summer with mature renters - no children, no pets, 4 adults maximum. 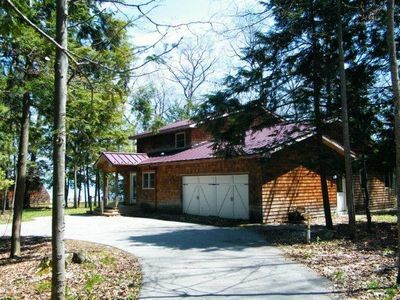 We are located on a private and secluded dead end road with Lake Michigan to our west and orchards and woods to our east. 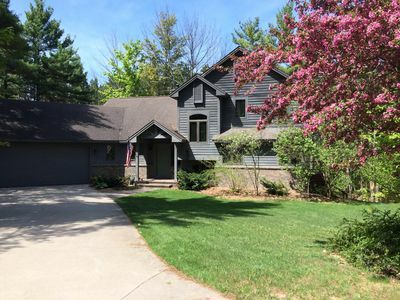 This ranch with lower level walkout is located on 115 feet of sugar sand beach on the beautiful waters of Lake Michigan just north of Northport Village. 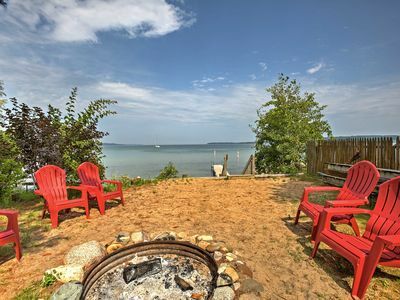 Our westward view of the lake not only gives you the breathtaking sunsets that are well known, but our unique location also views both North and South Manitou Islands and North and South Fox Islands. Start your morning with coffee and watch the sunrise from our garden patio which looks out over the eastward orchards. 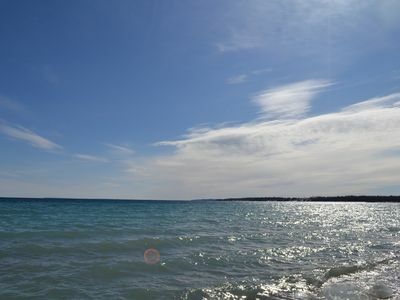 Take a late morning walk along the beach which takes you past Cathead Point to the north or Peterson Park to the south. Enjoy lunch at the granite bar counter in the screened porch while checking out the islands. 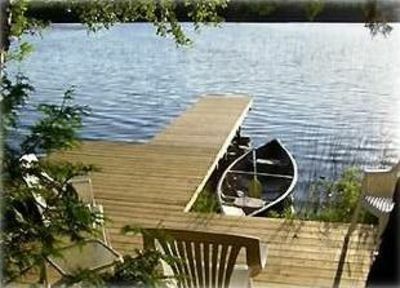 In the afternoon lay out on the daybed or the comfortable lounges and the deck or on beachtowels or adorondack chairs at the waters edge. 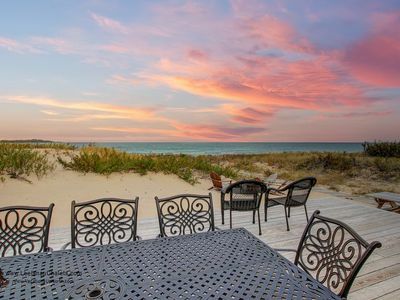 After dinner get ready for the fantastic sunset on the beach and then toast your memorable day at the fire-table back on the deck. 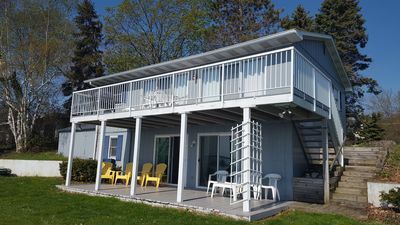 Upon retiring several years ago, we embarked on a total house renovation of our 2800 square-foot beachhouse. The main level has solid oak hardwood flooring and cathedral ceiling. 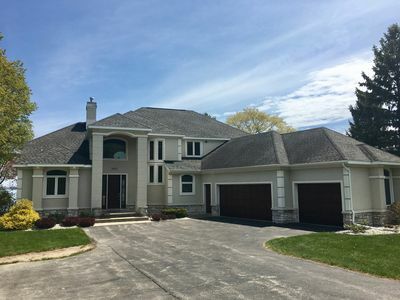 The great room features a floor to ceiling mid room natural fieldstone fireplace, 65” tv, two stained glass skylights and french doors that open to the composite deck surrounded by a glass railing for unobstructed views of the lake. 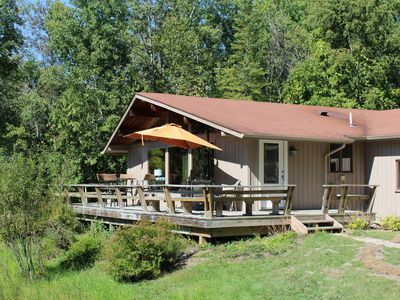 The room also has a sliding door entry to our cozy and comfortable screened porch off the main deck. 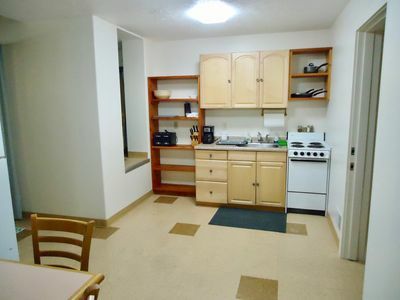 The kitchen has all new appliances, granite counters and all the gadgets any cook would need. The dining room also has great views of the lake where are you can enjoy your dinner cuisine on china and crystal from our cabinet . 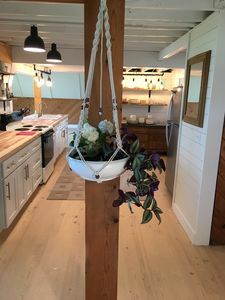 The laundry room and additional half bath are located off the kitchen. 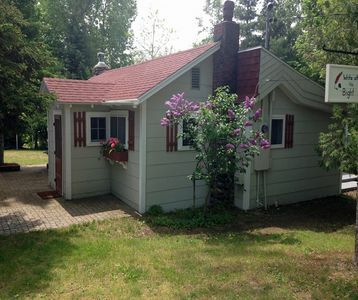 The master bedroom has a king bed with sliding doors to the lakeside deck with views and sounds too lull you to sleep. The master ensuite has tile floor, glass shower and granite countertop with double sinks. The second main floor bedroom has a queen bed and computer desk station. 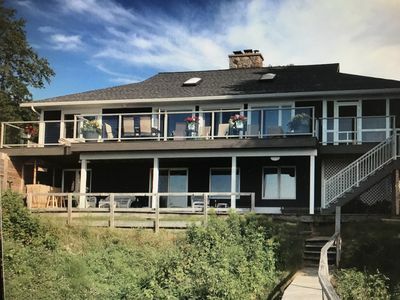 The lower level is a walkout to another large lakeside deck area. 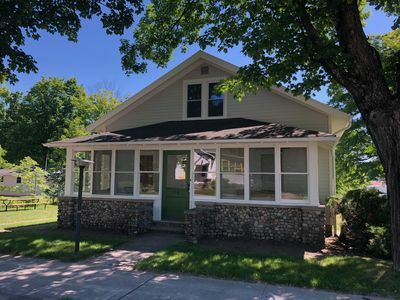 It features a tile floor game room and tv (55”) room area with two additional bedrooms one with a king bed and one with a queen bed and another full bathroom. The HVAC is a geothermal furnace with central air conditioning. Booking up fast! 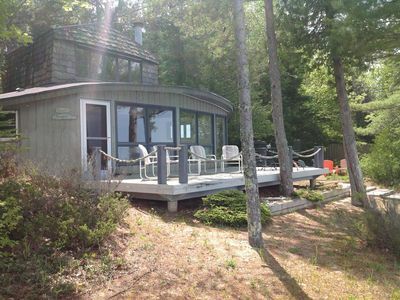 Beautiful West Bay house-kayaks, A/C, Wifi, sleeps 10, view! LOCATION LOCATION LOCATION! **NOW BOOKING 2019! 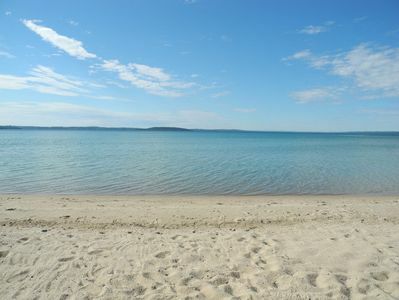 ** 100' Sandy Private Beach! 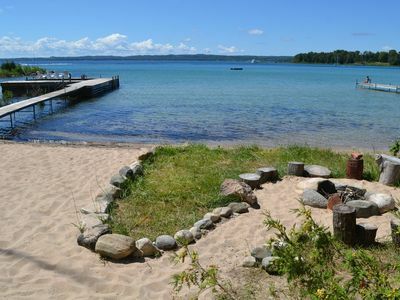 Studio Apt w/ Shared Beach-Steps to Suttons Bay! Location Location Location!!! 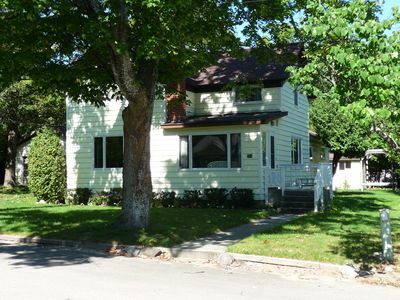 2 blocks from downtown Suttons Bay!! 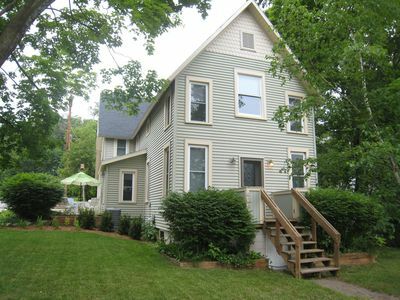 Northport home 2 minutes from the center of the village and beaches.